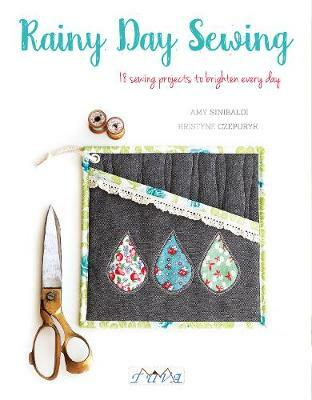 In her second book, Amy Sinibaldi, author of Sweetly Stitched Handmades, offers another delightful selection of well-designed projects you ll love sewing for yourself and loved ones. You ll find 18 projects that are sure to brighten up a rainy day or any day! Using easy to follow... read full description below. In her second book, Amy Sinibaldi, author of Sweetly Stitched Handmades, offers another delightful selection of well-designed projects you ll love sewing for yourself and loved ones. You ll find 18 projects that are sure to brighten up a rainy day or any day! Using easy to follow illustrations and step-by-step instructions, learn fun techniques that will make your sewing projects unique and charming. All the inspiration and how-to are right here in these pages. A variety of projects (including a lap quilt, a one-of-a-kind softie, modern cross-stitch, and zippered clutch) means you ll find something to sew for everyone. Rainy Day Sewing offers every sewist a chance to do what he/she loves best: create something beautiful that s stitched with love. Amy Sinibaldi, author of Sweetly Stitched Handmades, is the designer behind the popular blog nanaCompany, a popular source for free sewing tutorials. She is a frequent contributor to sewing books and magazines, including Better Homes and Gardens, Little Thing Magazine, and Love Patchwork & Quilting, as well as at eHow.com. She also creates embroidery designs for her nanaCompany shop on Etsy. She lives in El Segundo, California.